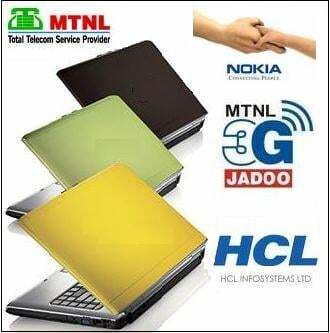 In a bid to Boost the 3G Mobile service, Mahanagar Telephone Nigam Ltd (MTNL), India’s first 3G mobile service operator, today announced its partnership with leading mobile phone giant NOKIA as well as leading Laptop makers HCL Infosystems Ltd.
HCL will offer 3G Wireless Broadband service on HCL’s select range of laptops and ME Net books. With this partnership MTNL 3G Data card, with its prepaid 3G GSM Wireless Broadband connections, would be available through HCL’s distribution channels and in Mumbai and Delhi by mid November. Mr. J V Ramamurthy, Chief Operating Officer, HCL Infosystems Ltd stated that “HCL’s 3G enabled ME netbook comes with an embedded 3G Module and a SIM card slot. With MTNL launching 3G device partnerships and attractive plans today, it is indeed an excellent platform for us to launch this netbook.” The 3G enabled HCL netbooks will be available in the market from mid November onwards. MTNL’s 3.5G wireless Broandband solution includes an embedded 3G module (Data Card) as well as inbuilt SIM card slot on HCL’s select range of ME netbooks, plus MTNL 3G SIM Kit and attractive 3G Data package with National Roaming facility from MTNL. Nokia is the world’s number one manufacturer of mobile devices by market share and a leader in the converging Internet and communications industries. Nokia makes a wide range of devices for all major customer segments and offer Internet services that enable people to experience music, maps, media, messaging and games. MTNL also that Bundled 3G Jadoo SIM shall be available with handsets of Nokia, HTC and Micromax makes. The operator also announced its 3G special offers of Festive season for Delhi circle with lowest Local-STD Voice and Video calls. F’k 3G, that isn’t going to be cheaper anyday, provided the 3G auctions project the high prices. WiMax is the way to go, cheap wireless high-speed broadband for laptops… true roaming. Imagine that day, roam nationally, 8Mbps unmetered for 1k a month!